Just before Thanksgiving the navel oranges come into the markets here in Southern California - quite sour at first but sweetening as the year goes by. I grew up in Redlands which was the center of the navel orange growing industry in the 1940s and beyond. I like to say I grew up in an orange grove but that wasn't quite the case. There were orange groves all around where we lived in the old part of the city however - with houses in amongst them. Now many of the groves have been pulled out and replaced with houses. As a child I spent many hours exploring the groves with my friends - in the days when your parents didn't have to worry where you were for hours at a time. 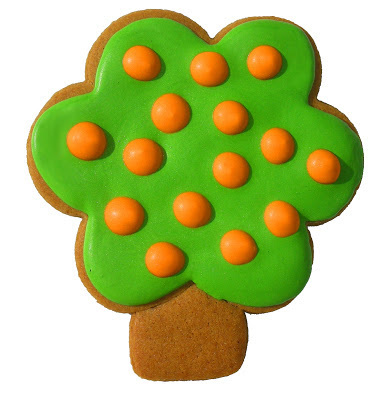 I was making cookies in the shape of fall trees by adding a "trunk" to a flower cookie and in the process made an orange tree. Redlands should adopt this as their official cookie! I love the shape, the colors, and the dimension of the oranges.